Wireless mesh networks, as a wireless backhaul technology, provide scalability, redundancy and reliability. 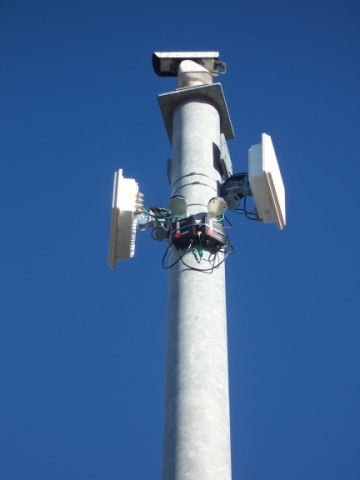 Fixed wireless mesh can be deployed on existing infrastructure, such as: buildings, traffic signals, and light poles, saving a lot of capital expenditures on the costs of mounting structures. Most outdoor wireless bridge radios that support wireless mesh networking operate in unlicensed wireless bands of 2.4GHz, 5.3GHz, 5.4GHz, 5.8GHz, or the 4.9GHz Public Safety band. There are several really good manufactures of wireless mesh equipment (Firetide, Proxim Wireless, FluidMesh, Azalea Networks, etc.). 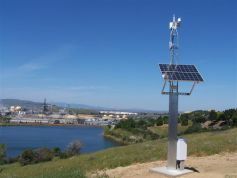 In a wireless mesh network, outdoor wireless bridge links are made up of a wireless mesh node that can send and receive wireless backhaul IP traffic. Wireless mesh nodes can function as a router, wireless access point, or a wireless gateway device. Through the relaying process, a packet of wireless data will find its way to its destination, passing through intermediate links providing reliable wireless backhaul communication. If one mesh node can no longer operate, the other mesh nodes can still communicate with each other, directly or through one or more intermediate links. Wireless mesh nodes can communicate with one or more nodes and can determine the best wireless backhaul path to transmit its traffic or perform load balancing on the network. Wireless mesh networks can be configured in a star topology or be made up of multiple types of configuration topologies such as: point to multipoint wireless backhaul or as a point to point wireless Ethernet bridge. Wireless mesh radios provide the ultimate flexibility from a single device. Wireless mesh radio platforms have become a popular wireless Ethernet bridge architecture. Wireless mesh first became prevalent in the push for Municipal Wi-Fi applications by the wireless mesh manufactures and by Municipal governments trying to get notarized by offering wireless internet access to their communities. Municipal Wi-Fi was driven mostly by local politicians trying to boost their political clout with very little understanding on the actual outdoor wireless bridge technology. Many of these projects failed because of the lack of having a good business model to offer wireless internet access and in most cases little or no RF engineering was performed (wireless site survey, spectrum analysis, wireless network design, etc.). Making matters worse many manufactures were guilty of over marketing the capabilities of their products (how many wireless mesh nodes that could be deployed before having to have a backhaul to avoid high latency and maintain adequate throughput on the networks) and by not educating their clients on the of potential wireless interference when using unlicensed wireless backhaul. Many municipal agencies consulted their hardware manufacture, which understand their equipment, but do not have actual experience in deploying outdoor wireless Ethernet bridges, nor should they. They are manufactures not wireless installation services companies. As many Municipal agencies soon found out that the cost was more than anticipated as they were told that to solve any connectivity issues they needed to just add more devices. The wireless mesh hardware platform was not the issue. The problem was the lack of proper RF planning (performing proper wireless site survey and spectrum analysis), wireless network design, and proper wireless installation. Wireless mesh is a good topology but as with any outdoor wireless backhaul it needs to be done by experienced wireless integrators. Recently, fixed wireless mesh has found a new niche market to serve. 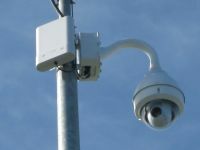 The growth of outdoor IP video surveillance has made wireless mesh a cost effective solution. Mesh, as an outdoor wireless bridge technology, provides the ultimate scalability and flexibility in network design. 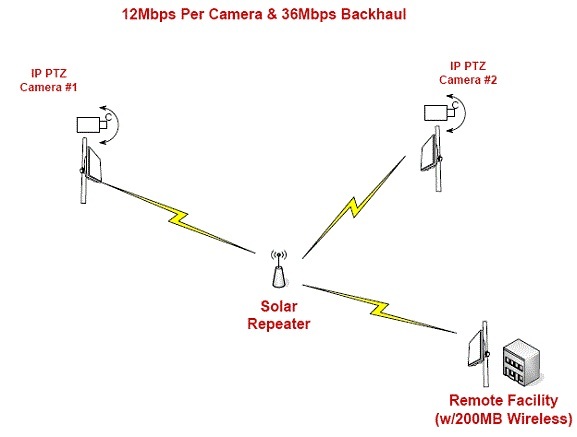 Wireless video networks can be scaled over time and wireless backhaul using mesh can allow cameras to be placed almost anywhere. Manufactures like Firetide, Proxim, and Fluidmesh were early adopters by optimizing their wireless mesh platform for video backhaul and have done a good job marketing to the IP video marketplace. 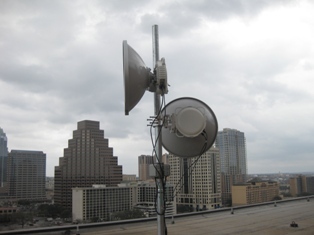 Outdoor point to multipoint wireless Ethernet bridge systems are flexible, economical, and easily deployed wireless backhaul solutions for connecting multiple remote sites to a network. 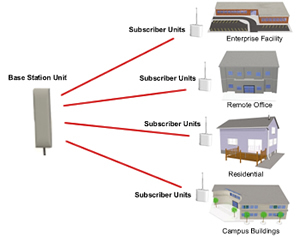 Point to multipoint wireless backhaul is an ideal wireless last mile solution for interconnecting campus buildings, remote facilities, security systems, access control systems, IP video surveillance cameras, SCADA PLC's, or WISP applications as a DSL replacement. Point to multipoint wireless can also be used to backhaul wireless mesh networks. Theycan also be used to eliminate telco dependancy or to provide wireless network redundancy. Point to multipoint wireless Ethernet bridge systems are made up of a Base Station Unit (BSU or AP) that can communicate with multiple Subscriber Units (SU's). Many systems can handle over 100 plus SU's per BSU. In most cases the BSU's provide a sector antenna beam pattern (typical is 60 degree, with some systems allowing external antenna configurations for expanding to 90 and 120 degree sector antennas). Multiple BSU's can be installed to create a 360 degree sector (like a typical cell site configuration). Point to multipoint wireless Ethernet bridge systems can operate in the unlicensed wireless spectrum (900MHz, 2.4Ghz, 5.3GHz, 5.4GHz, or 5.8GHz), the 3.65GHz WiMax spectrum, or in the 4.9GHz public safety band. There are propriatery point to multipoint wireless backhaul systems operated by various telecommunication providers that operate in the lincensed microwave wireless spectrums. Point to multipoint wireless backhauls is generally used where bandwidth requirements are generally low, such as a DSL or T1 repalcement. Recently though many point to multipoint wireless systems have taken advantage of the Wi-Fi 802.11n chip sets and can now provide wireless bandwidth up to 300Mbps aggregate throughput. Note: the actual throughput at any given SU is determined by the number of SU's connected in the system and the network configuration. Some of the better point to multipoint wireless systems use OFDM (Orthogonal Frequency Division Multiplexing) to provide better near and non line of sight ("NLOS") connectivity. The newer 802.11n chip set systems also take advantage of multipathing by incorporating MIMO (2x2 or 3x3) to give even better NLOS capability and higher bandwidth. The range of a point to multipoint wireless backhaul can extend as far as 10 miles with clear line of sight ("LOS"), by using high gain directional antennas connected to the SU's. The optimum performance though of most point to multipoint wireless is in the 1 to 2 mile max range. NLOS applications need to be closer to the BSU / AP in order to have adequate system gain. There are a lot of manufactures that offer point to multipoint wireless Ethernet bridges. Some manufactures have been in the point to multipoint wireless arena for many years. 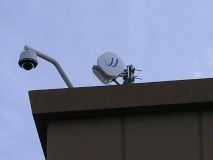 Proxim with their Tsunami MP.11 series (5054-R which is a tri-band 5.3GHz, 5.4GHz, or 5.8GHz system, MP.16 that is a 3.3GHz, 3.5GHz, or 3.65GHz licensed WiMax system, and their newer high bandwidth MP8100 series), Motorola with their Canopy wireless (their newest is their Canopy 400 series that operates in the 5.4Ghz and the PtMP320 WiMax), and others such as: Alvarion, Firetide, Trango, Solectek and BelAir. Some of the newer players include FluidMesh (which specializes in wireless video backhaul and wireless mesh), Ubiquiti,and InscapeData. When designing a point to multipoint wireless Ethernet bridge system it is highly recommended to perform a wireless site survey and a spectrum analysis. All systems regardless of how good they are have their limitations. The biggest source of failure we come across is unrealistic expectations of performance. Any organization thinking of deploying a point to multipoint wireless system should consult a professional wireless integration company that has a lot of experience designing and performing outdoor wireless installation. The video market is merging from traditional analog cctv to IP based camera systems. There are many advantages to IP based camera systems over traditional analog cctv. First, it's more cost effective to deploy IP cameras on existing IT infrastructure. Second, there are fewer points of failures (e.g. encoders, transceivers, decoders, multiplexers, analog monitors, etc.). Third, IP based cameras have more functionality. Fourth, it's easier to centralize and manage multiple sites. Fifth, better storage and achieving solutions. Finally it's easier for an IT department to support (they don't need special tools and training on coax. They already know how to work with CAT-5e). The drawbacks are the need for greater bandwidth across the IT network and the limitation of CAT-5e to 100m (unless you are using Ethernet extenders). The solution to both problems can easily be solved by the use of wireless networks. With wireless IP video cameras can be deployed virtually anywhere. Bandwidth also becomes a non issue as a wireless network can be scaled easily. Putting video across wireless can be tricky. To optimize video streaming over wireless, whether we are talking about point-to-point, point-to-multipoint, or mesh networks, some experience and knowledge is needed. First is selecting the right wireless equipment. Many wireless manufactures offer QOS and VLAN tagging capabilities which make for ideal video surveillance configurations, as we typically want our video network to be on a separate subnet than our traditional data and voice traffic. If you know what you are doing and have a solid background in wireless and IP networks it's easily done. The problem we see most of the time is the company doing the deployment is lacking in one of the areas. Too often we see installations that have issues because the installer just throw up a bunch of mesh equipment, using omni-directional antennas, hoping for a plug and play situation. What happens is a lot of self interference (along with outside interference) and too much latency on the network. Even though many hardware manufactures would like you to believe their equipment is plug-n-play that's not how it works in the real world. Someone that is well trained in wireless networks should be used to deploy any such networks so they can be optimized and configured properly. Understanding IP video is another area we see issues. Many traditional analog cctv vendors just don't understand IP networks well enough. If your vendor doesn't understand QOS and VLAN technology they probably don't have enough experience to deploy a wireless video solution. Just like wireless hardware not all being the same nor is the IP cameras. Some work well over wireless and some have issues. Choosing the right camera is important. It's best to make sure before purchasing and deploying any wireless video solution that you have (or at least get confirmation) that the matching of a wireless manufacture's equipment and a particular IP camera system work well together. My company, Alpha Omega Wireless, deploys a lot of IP video surveillance cameras over wireless networks. We'll be performing various test of different video cameras on various wireless equipment and will be posting regularly the results. Stay tuned!